Originally published in EMPIRE magazine, May 1995. 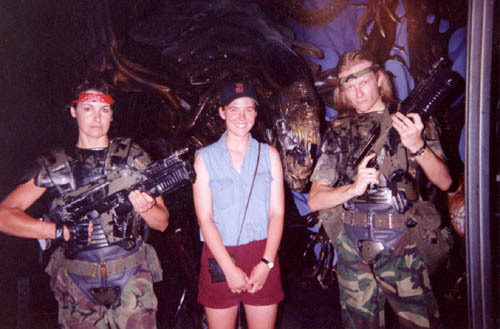 Carrie Henn and grunts at the UK’s Alien War attraction. In 1985, Carrie Henn was a 9 year old growing up on a US Air Force base near Cambridge. One day, some strange movie people came scouting for a photogenic little girl. Pictures taken, they returned from whence they came, and she thought no more of it. Then, out of the blue, the phone rang and a man, calling himself a casting director, inquired whether Henn would like to come to London to try out for a film called Aliens. And so she did.